It doesn’t matter what sport you’re in or what your athletic goals are – you can’t tell me you’re not interested in ab exercises! I get questions about the best ab exercises all the time, and that’s because most people only perform crunches and sit-ups (two very popular yet not very effective movements). To really develop your abs and achieve complete core strength, you need a complete set of exercises. Today I have a set of 10 very effective ab exercises for you. Unless you’re already devoted to “core training” (most endurance athletes are not), you’ve probably never even seen these! If you add just a few of these into your training routines, you’ll be able to increase your overall core strength and get some better definition on your midsection! Lose Some Fat and Really Show Off Those Abs! You may have seen this one before, and you probably thought is was just a chest or arm workout. Nope. It’s actually an intense core workout, too! Some studies show that the push up activates your core more than exercises like heavy squats – that might be pushing it, but there is no doubt, a proper push-up is a full-body exercise. Follow these instructions from my bodyweight exercise collection. The plank is great, but to really get results, see if you can do it on a stability ball. The position is basically a decline plank, but elevate your feet on top of a stability ball. The unstable ball will really torch your core! Even better, you don’t need tons of arm strength like with the decline push-up. The T-stand is similar to doing a side plank, but it’s tougher! Instead of resting on your elbow, you are on your hand with your arm straight. This extra leverage requires more work from your core (specifically your obliques) to maintain the posture. This is a super intense exercise that will hit you deep in your core! Grab some light dumbbells and get into a push up position with your feet further shoulder width apart (not together.) Then just row one arm at a time, slow and steady. It’s a core stabilization workout, not so much an upper back or arm workout; it’s not meant to replace bent over rows or anything where you’d use heavy plates. Too tough? The beginner version is called “elbow touches” and does not require any weights. In the same position, just lift your hand and touch the opposite elbow, then alternate arms. It sounds easy but it will push your core stability limits quickly. Stand up straight, holding two dumbbells overhead, like you just did a shoulder press. Then simply bend to the side at your waist, keeping your arms straight. Alternate sides. These are like Farmer’s Walks (the popular strongman exercise). They use less weight, but the weight is held overhead! 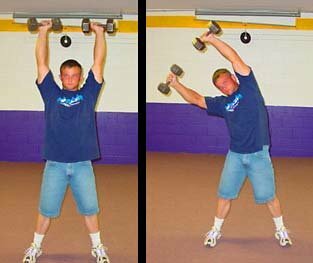 Using one arm at a time, grab a dumbbell and hold it overhead with your arm straight. Yes, you will look sort of like a waiter. Then you simply walk balk and forth in a straight line. It’s not that hard at first, but it gets difficult sooner than you’d expect. For experienced lifters: Bonus points if you set up tables and navigate between them in a zig-zag pattern for this exercise! Those ten should hold you over without a doubt! It will likely take some time for you to work your way down the list. But if you’re hopelessly devoted to core training, here’s something that intrigued me – it’s an ebook filled with 77 rare ab exercises! You might like it, too. A few of the exercises listed above are ones that I recently discovered in this book. Curl squats, for example, I had never seen or imagined before this! All you have to do is click this link! You can also right-click the link and download the book in PDF format so you have it on file. The complete book with all 77 exercises is only $19.95 – you can get it by clicking here. This article was originally published on January 30, 2013. It was updated and republished on July 22, 2018.